The content of this article provides interesting history, facts and information about the awning at the Colosseum. What was the Velarium? 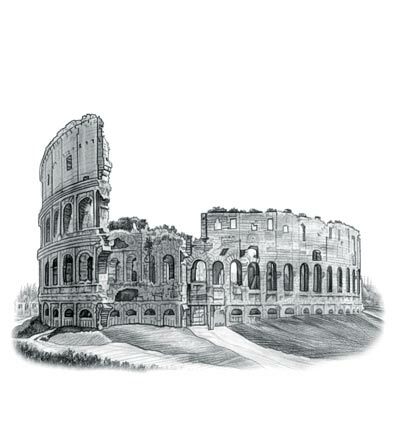 Definition: The Velarium was the Latin name given for the retractable, panelled, awning at the Roman Colosseum. Its purpose was to provide shade for the spectators who watched the gladiatorial games in the blistering sun and heat of Ancient Rome. The awning, or velarium, consisted of Roman shades made sailcloth, in either canvas, linen or cotton, attached to spokes of rope. The velarium or awning at the Colosseum could be extended or retracted with ropes and pulleys according to the position of the sun - the original Roma shades. Awnings were a common feature of all Roman theatres and amphitheatres as the pampered audiences demanded comfortable surroundings. Two hundred and forty mast corbels were positioned around the top of the Colosseum which supported the retractable awning, or velarium. (A corbel was the bracket projecting from the face of a wall which was used to support the awning.) The sockets where they stood can still be seen. The velarium or awning covered over one third of the arena of the Colosseum, and sloped down towards the center. The panels of cloth that the awning consisted of would have been tapered - wider at the top and narrower at the bottom to enable ease of retraction for these ancient Roman shades. The purpose of the awning, or velarium, at the Colosseum was to provide shade to the spectators. It covered just over one third of the inside of the arena because of the limited length of the post supporting it. It was not necessary to cover the whole of the Colosseum with a canvas because the walls were high and as the sun moved around it cast additional shadow and provided naturally shaded areas. There is no evidence to suggest that the awning was used to shield the spectators from either wind or rain. The velarium was a Roman sun-shade. In inclement weather the spectators were protected by wide brimmed hats and umbrellas according to the Roman writer Cassius Dio. The location for the awning mechanisms was above the maenianum summum in ligneis, also called porticus, which was the top row of wooden seats. A platform ran all around the edge of the top of the Colosseum where the men who operated the awning would stand. Who operated the Velarium or Awning at the Colosseum? It was believed that Roman sailors, enlisted from the Roman naval headquarters at Misenum, were used to work the velarium or awning at the Colosseum. As the awning were basically custom-made sails this does make sense. Roman sailors made possible the rigging of the large awnings over the Colosseum as they represented the only large body of skilled workers capable of envisaging and resolving any problems relating rigging or to weather changes especially in relation to the wind and rain. The sailors were housed in Rome in the nearby Castra Misenatium. Experienced sailors would be used to operate the velarium, or awning, and it was probably seen as a much sought after position in the Roman navy. Was the Velarium or Awning at the Colosseum dyed different colors? No one knows for sure he answer to this particular question. Awnings at theatres were known to have been dyed in various colors including purple, red, and yellow. It is also known that in Nero's wooden amphitheatre which was destroyed in the Great Fire of Rome, that awnings of silk had been used which were decorated with a woven picture of Nero driving a chariot. So, initially, colored or decorated awnings were quite feasible. However, the fabrics used in the awnings would become worn or torn needing replacing. It was possible that just as in the sails of boats, that patches of material was used for this purpose. The content of this Awning at the Colosseum category on life in Ancient Rome provides free educational details, facts and information for reference and research for schools, colleges and homework. Refer to the Colosseum Sitemap for a comprehensive search on interesting different categories containing the history, facts and information about Ancient Rome. Just like the subject of Awning at the Colosseum there is hardly a page of Roman history and the Romans that is not, on some way, connected to the Roman Colosseum which became a symbol of Rome, its society, culture and life.